The protagonist is a professional cleaner, which means he takes care of cleaning up murder scenes by disposing bodies, covering up blood stains and hiding murder weapons and other incriminating evidence. He takes on jobs without asking questions, working shady assignments for the mafia, as well as taking on jobs from mysterious clients, which will put him in harm's way... more so than what he's comfortable with. It's a dynamic stealth game, in which the player needs to figure out how to pick the location clean of evidence, while not getting caught. Exploring, experimenting and fast paced decision making are the key words here. Getting caught and questioned would put a black mark on the protagonist's career and the environment is crawling with itchy-fingered police officers. 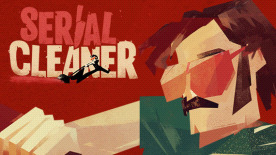 Serial Cleaner takes a humoristic, slightly macabre approach to its subject matter, and doesn't treat itself too seriously. Just take a look at the protagonist. He is a 30-ish man with a sharp sense of style and an iconic 70s look, complete with a mustache, large sunglasses, and tight pants.